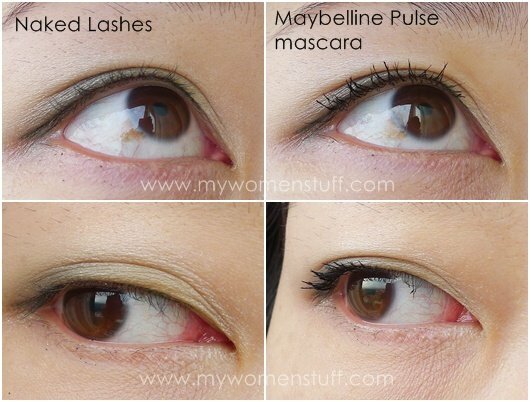 Yep, I do like the Maybelline Pulse Perfection mascara. I wasn’t too enamoured with its higher end sister from Lancome and at nearly RM60 its not a cheap mascara either. However, what I do like about it is not so much of the novelty, but the brush and its formula. Here’s the brush. 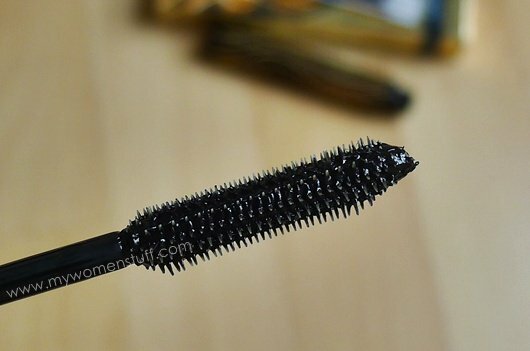 I love mascara brushes like this one – slim, with little short bristles that grab onto your lashes like thorns. Erm… not very good imagery there 😛 But truly, this brush is excellent for me! You can barely see my lashes in the before pictures and the after pictures show just 1 coat. I apply the mascara on curled lashes because it can’t curl my stubborn lashes, and because its just easier to apply mascara on curled lashes. 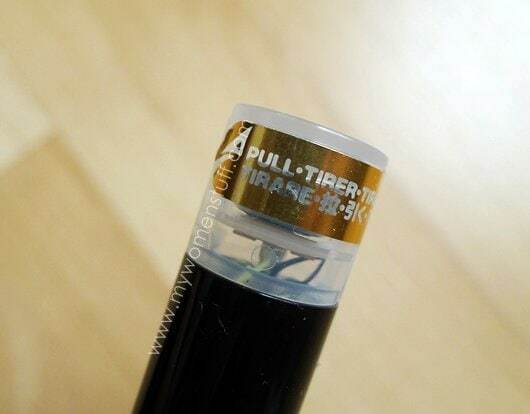 I usually wipe off excess mascara on the edge of the tube (there is very little excess which is great!) and position the wand just at the base of my lashes, and then depress the button at the end of the cap. The buzzing tells you the wand is “pulsing” but you still have to move your hand to direct it where it should go. Perhaps its my imagination, but I do seem to get thicker lashes with just 1 swipe (as you see in the photos) with this mascara than if I were to do it manually. I did try it manually, and I needed at least 2-3 coats to get that sort of volume. 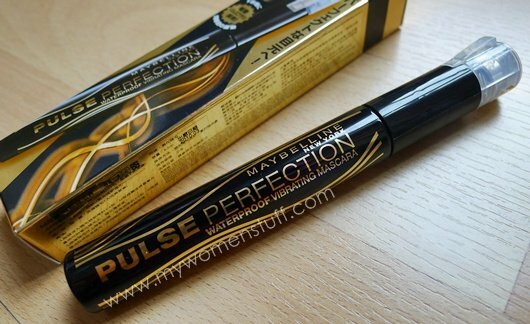 Maybelline Pulse Perfection mascara retails at RM59.90 at most Maybelline counters at major pharmacies and is possibly limited edition in Malaysia. NEXT POST: The 30 Day Lipstick Project will start in May 2011! Oooo!! I have it but I haven’t opened it yet ahahahah!! ^.^ was part of my post-assignment-round-1 haul!! Pretty cool but I dont think I’d pay RM60 for it. I’m currently using Cover Girl’s Lash Blast Luxe and it does wonders for me. That’s a good price and a good tip for anyone heading to Australia! I just stumbled upon ur blog, but i was eyeing this mascara, but never bought it. Now, after reading ur thoughts on it, it makes me wanna get it. The weird thing is that, I live in the US, but i can get the mascara for about 3 dollars USD at like these closeout places. I cant believe it costs $15. It originally retailed at US$15 when it launched in 2009 I believe but since then I’m sure its quite easily available now at discount stores (which you are lucky to have! 😀 ) For us this one’s limited edition. I hope it works for you! i dont like it!!!!!!!!!! i bought it the sec it went on shelf ( i mean like when they are about to put it on shelf) i just can’t wait !!!!!!! bought it when back and tried hate it!!!!! it does not lengthens volumise but just clumps my lash!!!!!! haiz why maybelline? why?! you used to be good!!!!!!!!!! well i think i over rated this 1 haiz but other mascara from them is just fab!!!! I have seen this around but I haven’t bought it yet because it is costs more than what I usually like to spend on drugstore mascaras. It looks great on you though. Maybe I should give it a try after all.. thanks for the review. I am intrigued with this! I want to try this! I’ve tried the Lancome one and the battery died on me too early!!!! Your Lancome battery died? Mine outlasted the battery but it eventually dried up so I binned it. Hope you get this one in Philippines soon! I bought this but haven’t gotten around to trying it yet. I am a one-mascara woman 🙂 I’ve thrown out a number of Maybelline mascaras before because they were so clumpy on my lashes. I just hope this performs better as it’s pretty pricey for a drugstore mascara. I wasn’t a big fan of it – liked the mascara, but not the vibrating bit. I found it clumpy with the vibrate on.